The origins of Bulldogs can be traced back to 1600 in the Isles and lands of Europe. 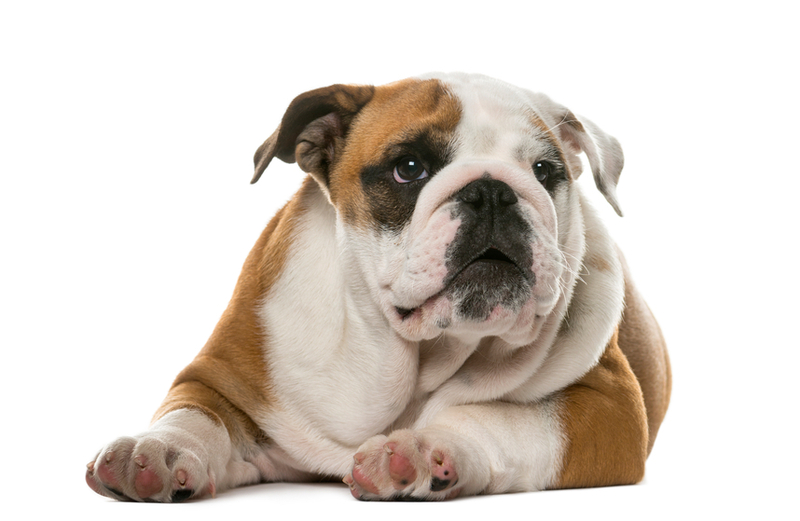 There has been controversy regarding the ancestry of Bulldogs. Few argued that the Bulldog is the result of crossbreeding between the Pug and Mastiff whereas Buffon contended Mastiff to be the ancestor. However, Alaunt is a common ancestor of both Bulldog and Mastiff. In the earliest book of dogs published in 1576 by Caius, there has been no mention of a Bulldog. However, he did mention a huge, ugly, stubborn and eager dog by the name of “Mastive”, and they were used for bull baiting. In ancient Greek, historians talk about fighting dogs of Britain and Molossian dogs used in battles. These dogs are said to be the ancestors of Bulldogs and Mastiff. These dogs were enamored with light chain body armor, blades and spikes and they would be let loose on their enemies. They were large in size and could knock over a man with armor. What historians seem to agree on is that Bulldogs owe their names to their bull-baiting days where they used to guard, control and bait bulls. Bull baiting was a sport back in the Middle Ages, popular among royalty and noblemen and even Queen Elizabeth enjoyed this form of entertainment. There was this belief that bulls should be first baited before they are slaughtered. It would make the meat more nutritious and tender. This belief became so widespread in England that butchers had to bait bulls before slaughtering them. Additionally, they were fined and penalized if found selling non-baited bull meat. Bulldogs were known for their courage and ferocity and their ability to put up a fight despite of the pain they had to endure. In 1631, Prestwick Eaton from San Sebastian, Spain first distinguished Bulldog from Mastiff in a letter he wrote to his friend. Historians think of it as a proof that at that point in time the Bulldogs and Mastiffs were becoming a different breed. 1835 saw bull baiting became illegal in England and with that, the breed lost its ferocity. However, there still were people who felt a tinge of disappointment at the thought of endangerment of the species and decided to preserve the breed with all their splendid qualities. They took the task forward by eliminating their undesirable qualities and shaping the finer qualities. However, this whole cross-breeding brought along health problems accompanied with changes in body type. This species would have been extinct if not for its exportation to Germany and the United States. Bulldogs were crossbred in Germany to eventually create the boxer. However, Bulldogs continued to work at cattle and herding hogs in US, parts of South in particular where the terrain was tough and did not allow for fences. Through cross-breeding with pugs or selective breeding with smaller dogs, Bulldog was bred to a smaller size in England. John D. Johnson is one of the two men responsible for saving the breed and for the creation of American bulldog. He started selectively breeding herding bulldogs in the 1930s in rural Georgia while he was a teenager. John was later joined by Allen Scott of Alabama in 1960s, but they had different ideas of how a bulldog should be so they part their ways eventually. Scott bred the Scott type, the performance or standard type which was smaller. John, on the other hand, bred the classic type and they were larger in size. Breeding bore results and after a few decades of breeding, Bulldog became one of the finest breeds without its viciousness. Bulldog was now viewed as a dog people showed off proudly. With its sociable and loving disposition, Bulldog has become a favorite among pet owners, dog owners to be specific. It is also used as a mascot by institutions throughout the world to denote strength in the face of battle and adversity. The English bulldog is everywhere, be it the Marine Corps, US Army, and Navy, universities, sports team, schools, and businesses. Despite its history, Bulldogs did not become extinct and is a famous breed known for its loyalty, courage, and devotion. Take a moment to appreciate how far your pup has come from the savage to this adorable companion.